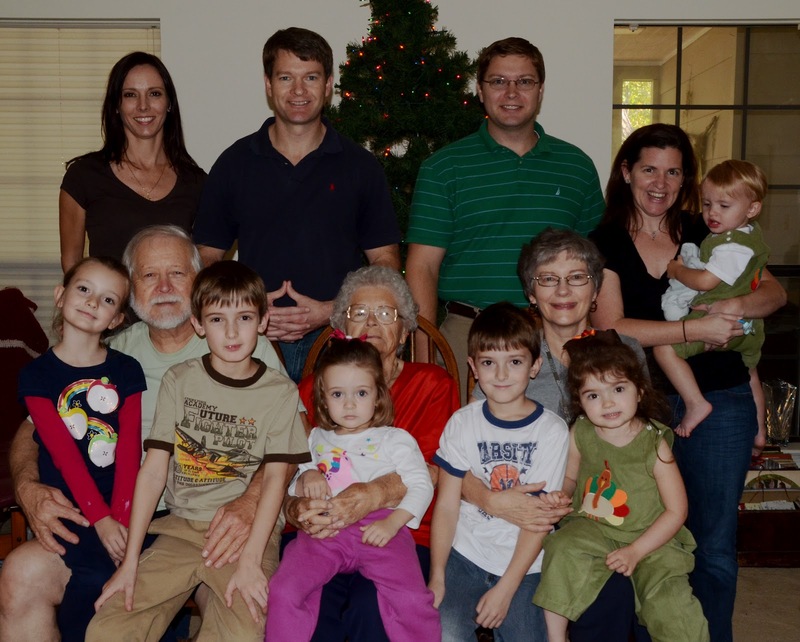 Celebrating Thanksgiving 2011 with our sons, their wives and their little ones was an extra bright spot in some challenging times. We gathered at our house the day after Thanksgiving. Our offspring and their families spiced up our non-traditional holiday meal, simple and casual, with appetizers and sweets. The only Thanksgiving turkey was a company of cupcake turkeys created by daughter-in-law Katie and granddaughter Molly Kate. The colorful, whimsical cupcakes were a hit with kids and adults. 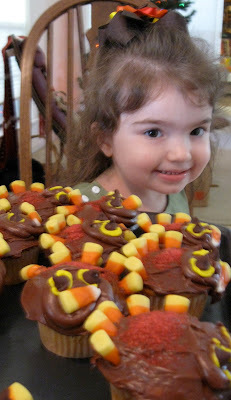 A proud Molly Kate offers yummy chocolate cupcake turkeys. After lunch moms, dads and kids helped decorate Nana and Baboo’s Christmas tree. Grandson Nate works from the bottom up. Little Walker and Stella, our youngest grands, were both a bit under the weather. Basking in the attention of his older boy cousins Luke and Nate, Walker perked up, and his usual sunny smile was in evidence for a while. Alas, I was never in position to catch that heart-warming smile. I was acutely aware of the post-stroke limits to my mobility and to my ability to photograph youngsters in action. The reality is, though, that I am thankful to still be around to experience that smile. That smile and the individual personalities of these special little people truly made my list of blessings extra-long on this day of thanksgiving. 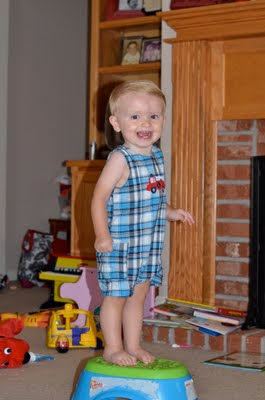 So here is a photo of that smile borrowed from daughter-in-law Katie’s blog. Baboo took advantage of warm weather and set the scene for an extended do-it-yourself dessert with a campfire and the chocolate, marshmallows and graham crackers required for s’mores. Adults and kids roasted and sometimes gleefully incinerated marshmallows in their quest for the perfect s’more. I observed and snapped a few photos from the stability of a sturdy camping chair. I didn’t quite trust my post-stroke ability to maintain balance around the combo of fire and half a dozen little bodies. I did not want to bump anyone into harm’s way. Even so, I enjoyed the camping treat, thanks to grandsons who toasted marshmallows and assembled s’mores for me! 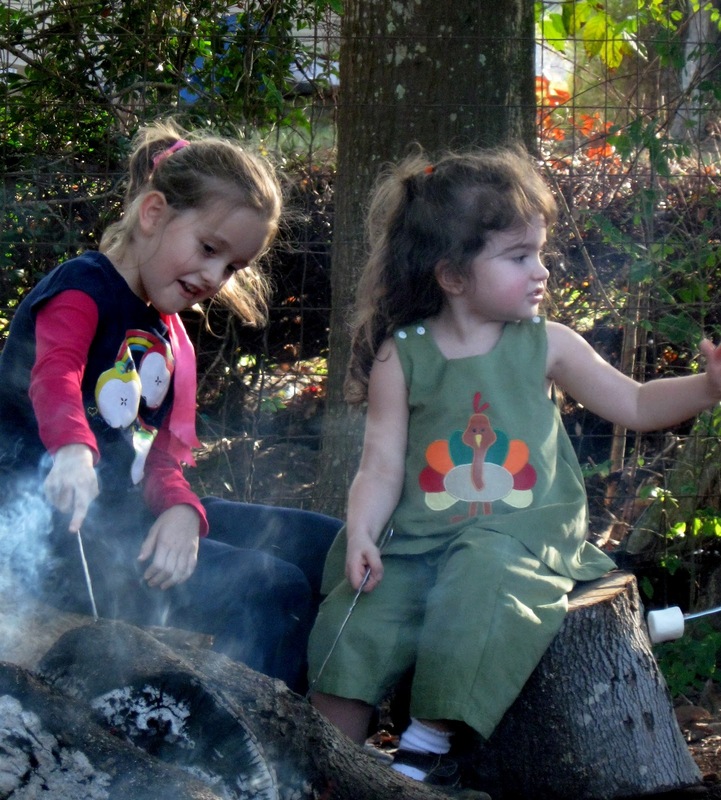 Granddaughters Charlie, left, and Molly Kate hone their skills for roasting marshmallows and keeping conversations lively around the campfire. Eventually Luke, Nate and Charlie had their fill of s’mores and wanted to try out my point and shoot camera. They did remarkably well. One of my favorite images was the photo of Stella below, a result of Charlie’s fascination with close-up images. Once Stella had satisfied her appetite for s’mores, she retreated to her mother’s lap for a snuggle. Charlie captured Stella peering out from the midst of her mimi. 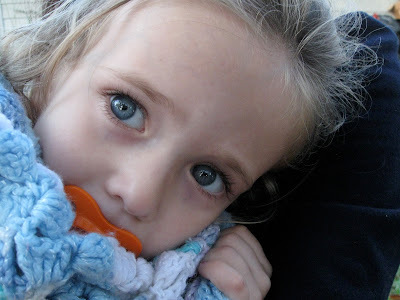 “Mimi” is what Stella calls the crocheted confection that Grandma Sugar created for her. Through the years my mother-in-law has crocheted comfy, colorful afghans for all her kids, their spouses, her grandchildren and her great-grandchildren. Happiness is . . . grandchildren! You have such a beautiful family. You look so good. Thanks for sharing. Charlie's photo of Stella is my favorite here, it is gorgeous! Thanks for sharing these wonderful Thanksgiving memories for us. Molly Kate is so cute here, and I have made these same cupcakes twice now! Happiness certainly is grandchildren. 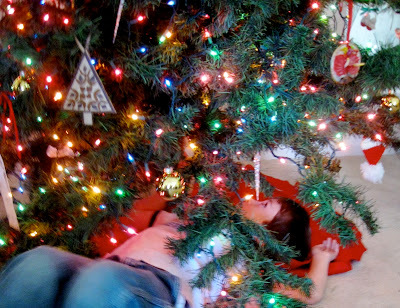 I like the saying, "If I had known how much fun grandchildren were, I would have had them first. Such a beautiful family and I like how you incorpoated the two holidays with the trimming of the tree. Be proud Grandma. I too liked the close up. Nice job Charlie. wonderful memories here. i like those cupcakes and the sweet little cupcake looking at them. 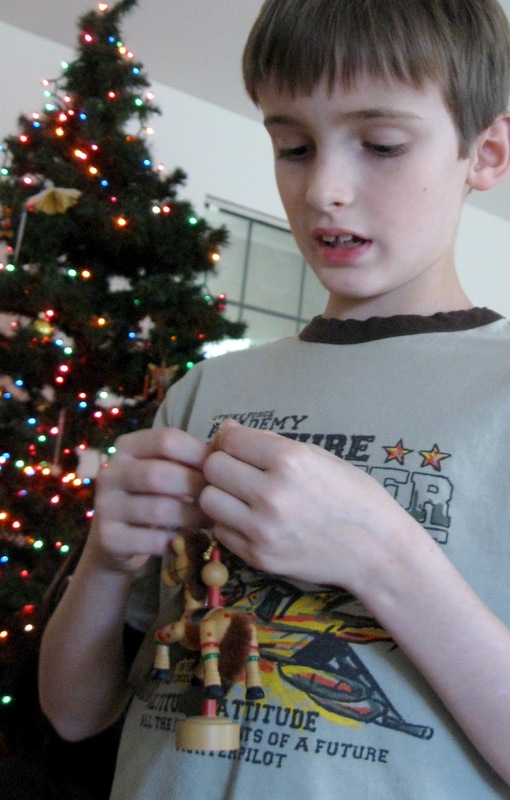 Thanks so much for the look back at your Thanksgiving 2011. Your photos are so sweet, especially Charlie's photo of Stella! I totally agree, "Happiness is...grandchildren!" Delightful. 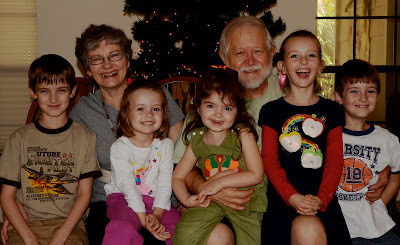 there is nothing like the Grandkids and the joy that they bring. Mine are much older than yours but I still love them and look forward to our times together. Charlie did a fantastic job on that close-up.